“We shouldn’t forget Si A Piao either,” Hsu added. Chinese-Indonesian comic characters Put On and Si A Piao are respectively the brainchilds of Kho Wan Gie and Goei Kwat Siong. The comic artists, both of Chinese descent, always presented special comics from the Lunar New Year until the celebration of Cap Go Meh (the 15th day of the first month of the lunar calendar). Their legacy, however, goes beyond the Chinese holiday season. Through their light-hearted comic strips, the artists shared the life of Chinese-Indonesians, including their strong sense of nationalism. 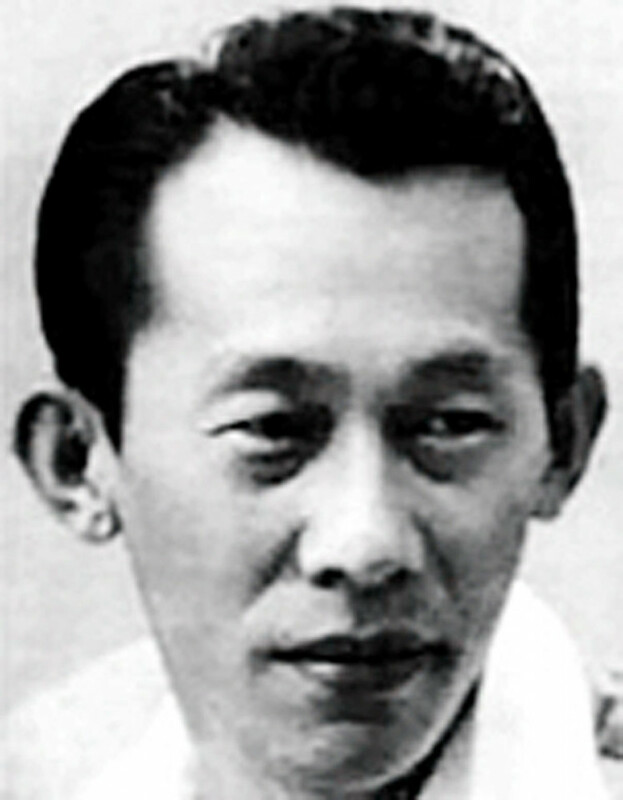 Kho Wan Gie, the first Chinese-Indonesian cartoonist to gain prominence, was born in Indramayu, West Java, in 1908. His cartoons first appeared in 1930 in Sin Po, a Malay-language newspaper for the ethnic Chinese. A year later, Kho launched the Put On comic strip, which published on Fridays and Saturdays. Put On is believed to have been derived from Chinese Hokkien dialect, meaning an active man. 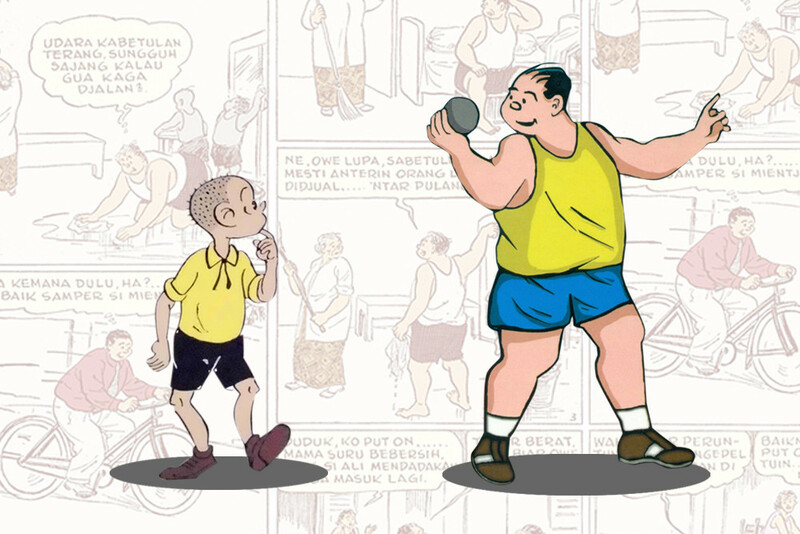 Kho, however, stated that the title originated from two English words, which conveyed his hope that the comic strip would always be at the top of the reading list of middle class Indonesians of Chinese descent. The title character Put On — inspired by Jiggs from George McMannus’s comic titled Bringing up Father — won the hearts of many readers. Put On is described as a humorous and candid young man who often faced swee-siao (mishaps). Put On is helpful, empathic and mingles with all ethnic groups. He loves Indonesia despite the government’s discriminatory regulations against people of Chinese descent. 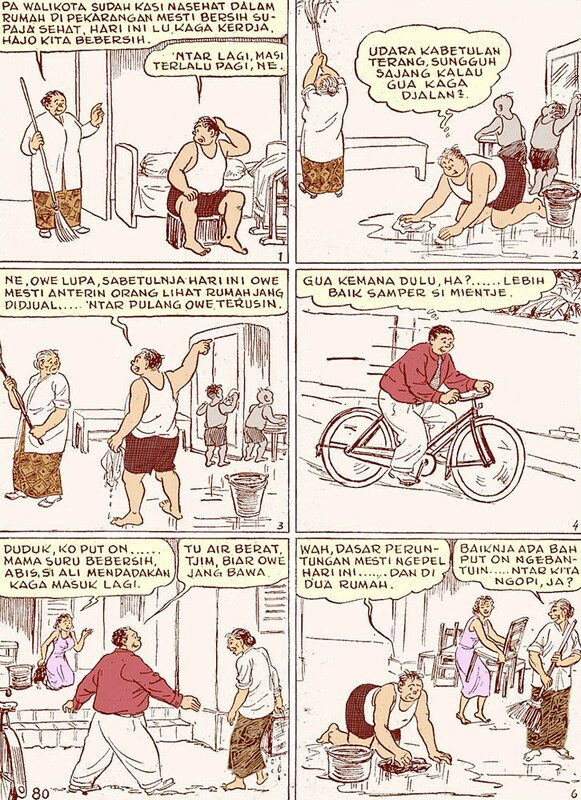 In one comic strip, Put On shows his willingness to help Indonesia regain West Irian (now Papua) from the Dutch in 1961. The comic also shows many lovely characthers, such as Put On’s mother Nee, his younger brothers Si Tong and Si Peng, his friend On Tek, as well as first-generation immigrants A Liuk and A Kong. Put On’s girlfriend is Dortji, a Dutch-mannered ethnic Chinese. Put On enjoyed high popularity from the 1930s until the 1960s to the point that the term “Koh [brother] Put On” was often used by people to describe an overweight and naïve man. Put On has inspired similiar comic strips, such as Si Tolol (The Fool) in Star Magazine and Oh Koen in Star Weekly. The beloved comic strip came to an end following the communist purge in 1965. Many prominent ethnic Chinese artists and figures became targets. Although Kho wasn’t engaged in politics, he withdrew from the comic scene. In the mid-1970s, the authorities alleged that Kho was behind the new comic strips Nona Agogo and Djali Tokcher. Amid the suspicion, another comic allegedly created by Kho appeared. 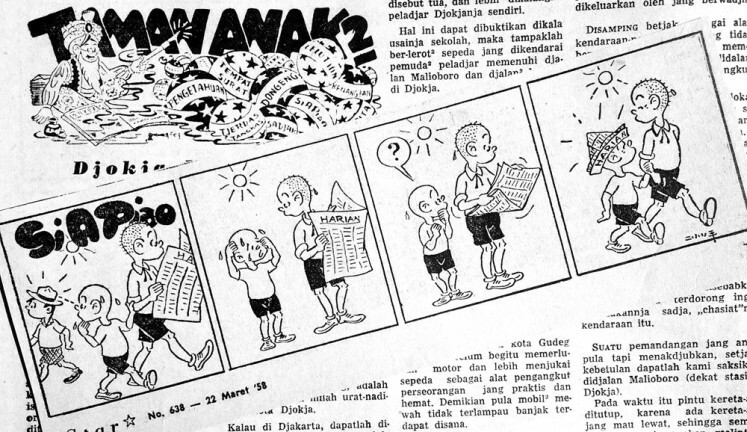 The comic title, Sopoiku (“who is it” in Javanese), appeared to mock the political enforcers that might have pursued him. Sopoiku survived for several years. Kho passed away in May 1983. 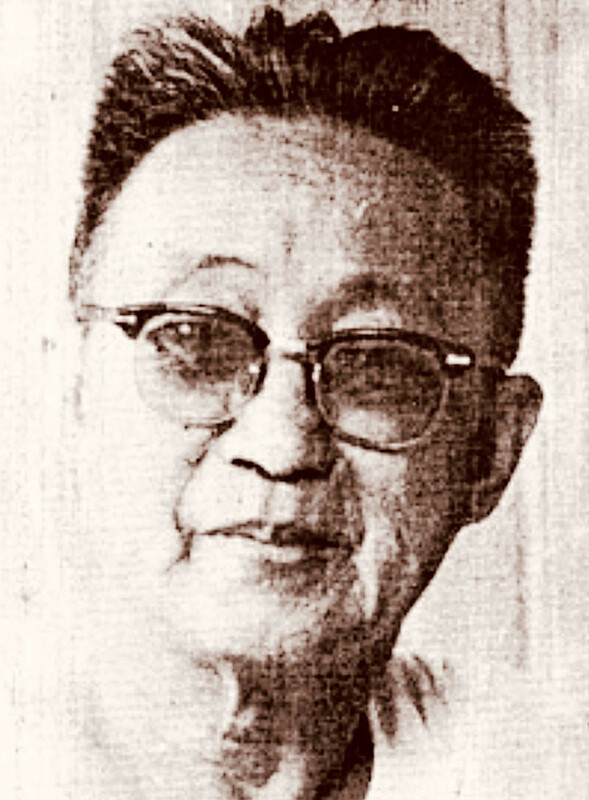 While Kho’s works are dedicated to adult readers, cartoonist Goei Kwat Siong presented entertainment for children through his comic strip Si A Piao. Born in Pekalongan, Central Java, in 1919, Goei specially created Si A Piao to be published in the children’s section of Star Weekly — a weekly led by Ouwyong Peng Koen (PK. Oyong) who later founded Kompas daily. Si A Piao was portrayed as a kind and helpful boy who loved to read. He is smart but sometimes forgetfull. In one comic strip, A Piao and his younger brother are walking under the sweltering sun. A Piao then folds a newspaper into a cap for his brother. In another episode, A Piao hilariously waters plants in a park while it is raining. Goei did not write words for the comic strip so children could easily understand it. Perhaps inspired by his job as a school teacher, Goei provided plenty of educational stories in his comic strip. Many suggested that the titular A Piao was as a blend of two comic characters — Henry by Carl Thomas Anderson and Sanmao by Zhang Leping. Kho and Goei have left us, but their legacy lives on. People of the older generation will always remember the expressions of Put On and A Piao when saying: “Sin cun kiong hi....gong xi fa cai...mana angpao untuk saya?”(Happy and prosperous New Year…Where’s my red envelopes containing cash? ).